A model launched in November 2013, Louis Vuitton Monogram Pallas is another classic that the famous fashion house decided to update and reinvent. The last few Louis Vuitton seasons have actually abounded in bag models reiterating the iconic items of the past and this monogram bag is just another example of how Vuittonâ€™s designers know to explore emblematic trends and reinterpret their own history. Since many of the trends are going in a retro direction, this is the best moment to go for a reinvented bag as this way you can be sure you are in tone with the latest fashion trends. A tote shaped bag with solid leather handles featuring the monogrammed leather that made the Louis Vuitton houseâ€™s reputation around the world, Louis Vuitton Monogram Pallas is the item you want to choose for daily use if you want a reliable and very elegant bag that can suit in everything you need without compromising on your stylish look. The signature will stand out, making you visible from the crowd and distinguishing your impeccable taste. Inside, everything is designed for your ultimate safety and comfort: phone pockets, zipped compartments and cotton linen. Everything a modern woman needs. 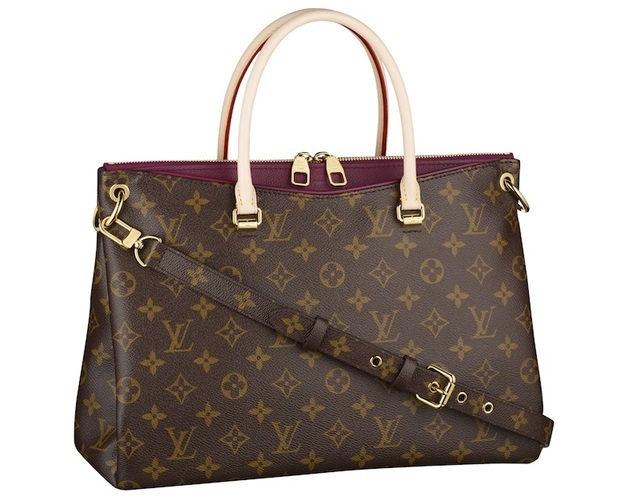 Just as you would expect from a Louis Vuitton product, the Monogram Pallas bag will never disappoint you. Moreover, it will attract compliments from all sides, no matter which of the five chromatic tones available (Quetsche, Aurore, Havane, Black and Safron) you will choose. It will complete your elegant style and it will improve your level comfort. Â If you want your style to be displayed in brilliant yellow, pick the Safron color and you will sparkle like a star. If you like purple tones, Quetsche is your best choice. Havane will bring you the sweet touch of brown.